We found this recipe on Little Broken. 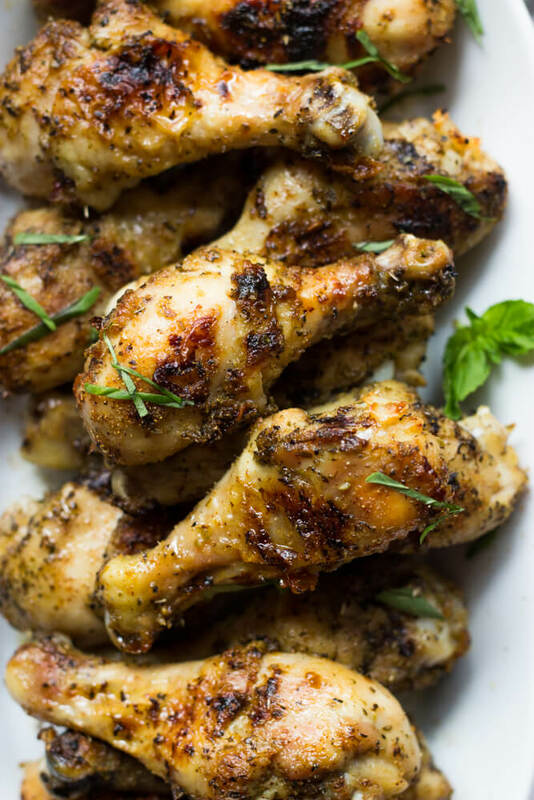 "Ridiculously easy and foolproof oven roasted chicken drumsticks. Seasoned perfectly with a mixture of dried herbs and then roasted until golden crisp on the outside and melt in your mouth tender inside. This is a family favorite every single time!" Preheat the oven to 375 degrees F. Line a rimmed baking sheet with parchment paper. If using aluminum foil, lightly coat with non-stick spray. In a small bowl, mix together all of the spices and set aside. Place the chicken drumsticks into a large bowl. Make sure they have already been pat dried with a paper towel. Add olive oil and using your hands, toss to coat. Sprinkle in the seasoning mix and using your hands again, toss the drumsticks making sure each piece is thoroughly coated with the seasoning. Arrange the drumsticks on the prepared baking sheet and roast for 30 minutes. Then flip the drumsticks and roast for additional 25-30 minutes. If desired, broil for 2-3 minutes for extra crispy skin.